Christmas party games murder mystery game Who Killed Santa? One of the best Christmas party games available! A real Christmas mystery! The portly gent who dresses in red won’t be going down any chimneys this year. He is dead – possibly murdered – yes it’s scandalous but true. Was it revenge for an unwanted present? This mystery party game is perfect for Christmas parties at the office or at home. The host’s guide contains decor ideas for your Xmas party. Perfect for Xmas holiday parties! NOTE: There are different versions of SAFA Additional Female Character Set descriptions and name tags that are to be used for all girls parties. These files come included in the SAFA set. You can use the same kit as a play for 8 to 16 guests or download even more characters and use it as a “meet and mingle” kit where everyone mingles and talks about their Santa clue(s) and then hears some Reports. 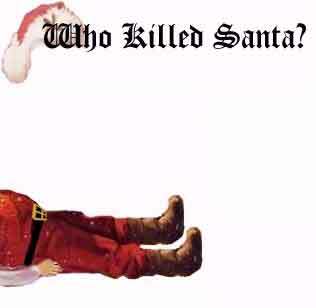 SKU: SANTA Categories: Girls Mystery Party Games, Who Killed Santa? The portly gent who dresses in red won’t be going down any chimneys this year. He is dead – possibly murdered – yes, it’s scandalous but true. It happened just before the company Christmas party being held at Chatties Restaurant. Did someone not want him to be there? Was it revenge for an unwanted present from Santa last year? Or was it just old age catching up with him? We’re here to find out the real juicy truth. The media are also here. But this time they aren’t just reporting what happened. They are suspects too. “Thanks for a great evening! Just wanted you to know that your murder mystery “Who Killed Santa?” was a hit here in Marion, Illinois. Our church always has a family night of fun and games on New Year’s Eve, ending with a service of communion at midnight. This year we wanted to jazz it up, and your script was a hit! My husband and I served 37 people ranging in ages from 5 to 85. The meal was elegantly done (my husband is a great chef so the part of Lorenzo fit him perfectly) and the guests really enjoyed being dramatic. All came dressed in costumes as best they could, and were not shy about “hamming it up.” As hosts, we did not read any of the clues or the answers before hand, so were able to play along with everyone else. No one guessed correctly who murdered Santa. Thanks again for your creativity. The fact that your script was appropriate for all ages even in a church setting was very much appreciated. This New Year’s Eve celebration will be remembered for a long time to come! Helen had never held a mystery dinner before, but she found that running “Who Killed Santa?” was no problem. “Thank you so much! Everyone had a blast! The night was a success. Everyone came in character and to make it a little more fun I made some women play male roles. Gibson Downs was especially funny being played by a woman. “We just had a birthday party for our now 13 year old daughter. We did “Who Killed Santa”. We all had a wonderful time. It was an easy party to host and everybody said they had a great time. A couple of people told me that it was the best party they had ever been to. We had about 35 people there from ages 18 months to 70 years old. It was great how everybody mingled and talked to each other, adults talking to the kids and teenagers and vice versa. Everybody came in costume and did such a WONDERFUL job of that. Since Josh Frasier was into his monopoly money, he gave the killer a get out of jail free card at the end and Santa’s lawyer offered her services for half off. We originally had told people that steak and lobster was on the menu, because nothing was too good for our precious daughter. When Santa died Lorenzo announced that he was too frazzled to prepare the steak and lobster, so he opened the salad bar to an all you can eat buffet. We had prepared deli trays and a big arrangement of produce for salad. It was great. I can’t say enough good things about the evening. I know it will be a party that my daughter will never forget. My other daughters plan on having the same kind of party when they turn thirteen. Thanks for everything. I will be recommending you to all of my friends and will be buying parties from you in the future. “Stephanie, I just had my Christmas party for 45 people and your Mystery was a huge hit!!! Each year I do a theme party and this one was the best yet. Everyone had a great time and could not wait to find out “Who done it”….Your online support was the best, and I appreciate you helping in every way that you did. You’ve made this year Christmas Party one that everyone will remember for years to come. MY PARTY WAS THIS PAST FRIDAY NIGHT IT WAS THE MOST FUN WE HAVE HAD IN A LONG TIME. IT WAS AMAZING – THE WAY THE QUIETEST MOST RESERVED FRIENDS WE HAVE – BECAME THESE WILD OUTSPOKEN CHARACTERS. THE PARTY TOOK ON A LIFE OF IT’S OWN. ONCE IT W AS SET UP – I JUST STOOD BACK AND WATCHED THE MYSTERY UNFOLD. PEOPLE CAME IN COSTUME, IN CHARACTER (a few have adopted the personalities as their own). IT WAS WITHOUT A DOUBT THE BEST PARTY I HAVE EVER HOSTED. WE WILL TALK ABOUT THIS NIGHT FOR A LONG TIME. AS FRIENDS WERE LEAVING, THEY ASKED WHEN THE NEXT MURDER MYSTERY PARTY WAS BEING HELD. THANK YOU FOR THE WONDERFUL IDEA, SCRIPT, ENTIRE PACKAGE. “Stephanie, I just want to tell you that we did our company Christmas party last Saturday (12/14) and did the murder mystery – Who Killed Santa and it was fantastic!! Nobody knew what we were doing and we handed out bags with their character, clues, props, etc. In the 16 years of our Christams parties, this was way far from the norm and everybody loved it. Their remarks were – this is the best party yet, this was so much fun, awesome, etc!!!! Everybody had a blast. No negative responses from anyone – even those who you might think wouldn’t want to stray from the norm as far as our Christmas party goes. It made all that attended have to talk with each other. Normally at our parties there are tables that kind of stick together and don’t always mingle with everybody else. This made everyone mingle and nobody minded! For the next week at work we were all calling each other by their character names! It was GREAT! So I just want to thank you for your help and let you know how it went. I’m sure we’ll do it again! In fact we may do one as a fund raising event to raise money for the American Cancer Society. If you have any ideas – let me know! “We just had our Mystery on Saturday night and thought I’d let you know we had a great time! There were several people that got into their roles and wore great costumes to enhance their part. There were several skeptics before the event and we weren’t sure how it would turn out. In the end everyone had a great time, and the skeptics are still talking about what a great time they had. We even had one person guess the killer! As for the photo contest, I’m submitting a picture of one of our technicians, Weldon Barnett. He played the part of Bert McGill, motorcycle shop owner. Keep in mind that Weldon has to be one of the most conservative of all our our staff, so we were all quite shocked to see him in his costume. We just worked with him on Friday (when he had hair) and on Saturday night he showed up with a SHAVED HEAD! Wow! He got INTO IT! It was great. Here are the promised pictures from the “Who Killed Santa” party, it was a lot of fun and everyone enjoyed themselves. “My name is Aeran Schmid. I purchased your “Who Killed Santa?” Murder Mystery package back in November and we (Cropper Motors) just had our party on December 12th. It was SO MUCH FUN!! We had quite the dramatic group of people. Everything went smoothly and I thank you for making the preparing process very easy to follow. Maybe next year, we’ll look into getting another one of your party packages. I attached some picture of our party and I would also like you to submit them in your contest. I hope you enjoy the pictures as much as we enjoyed our Christmas party. “My company played the murder mystery game “Who Killed Santa?” at our company Christmas party this year. What an absolute riot!!! We had so much fun. We enticed our employees to “dress and play” the part by offering a $50 cash prize for the best character portrayal. Wow, that did the trick! Not only did people dress in character, some had props, accents,…many added flair and personality to their character. When it came time to reveal the killer we had several people with the correct answer and had to draw a winner for another $50 prize. So glad we chose to play this game at our Christmas party. We would do it again. Everyone was involved, there was much laughter and jokes throughout the evening! I would highly recommend this to any company looking to do something fun at a party. “I purchased your “Who Killed Santa” kit for our annual holiday function at work. Every year it is very challenging to try to come up with a group/team-building activity so that all may attend and enjoy themselves at the same time. This was perfect! Our environment is not typical in that we’re composed of mostly scientists (which tend to be introverts) so it was great to see many folks come out of their shells and really get into their character. This was such a success that I’m not sure how I am going to top the next holiday function! I’ve attached pictures of folks dressed in their characters. There were way too many to attach but I wanted to pass along our sincere thanks. We hope you come up with more ideas for future events! I run the business. I spend a lot of my time just making sure everyone is pulling their weight and everything is under control. In my spare time, I like to do sign language and play classical guitar. That’s why my nails are long. I’m a bit edgy because I’ve just given up smoking. I run the company’s office by day and at night I run my husband. I’m the mother of two non-toilet trained individuals. I’m also a softball player. I’ve worked here ever since I left school. I’m very good at shorthand and can type 100 words a minute. I expect everyone else to be as efficient as me, but they never are. I’m a graphic artist. I’m one of the most creative people alive today. I’m also a mother. I’m the production manager. I have an eye for detail. I love animals. I am an account executive and I’m a cool dude that the ladies love. I take care of the client liaison for the organization. My good looks and charm have won many hearts and attracted clients to the business. I am a great asset but they don’t seem to realize that. I am an account executive and I’m someone that men love. I take care of the client liaison for the organization. My good looks and charm have won many hearts and attracted clients to the business. I am a great asset but they don’t seem to realize that. I’m the “fix it” man who repairs the company’s computers and backs up all the data. I spend most of my time indoors and could do with a bit more exercise. I’m in love with Mrs Claus. I’m the IT person who repairs the company’s computers and backs up all the data. I spend most of my time indoors and could do with a bit more exercise. I admit that I was in love with Santa Claus. I can’t believe someone has killed him. He was so sweet (sob sob). I’m the President of Gas Plus More convenience stores and gas stations. I’m a great pilot and I love flying planes. I’ve been a friend of Martina and Nick for years and their company gets their gas from us. I’m the boss of SDX TV station. The company advertises on our TV station. I’m into natural remedies but that doesn’t mean I’ve got my head in the clouds. I’m a very effective and firm boss. I just believe everybody should eat healthy natural foods and drink lots of herbal teas. My children are teenagers now. The directions for how to set up everything before the party were helpful. We were 22 people with “kids” as young as 16. We ALL had a great time! Definitely a fun way to spend a night together and have your guests mingle with everyone!